Auto Locksmith London is a London based company that specialises in providing auto lock solutions for customers based in parts of the city of London and the London metropolitan area. We offer a wide range of services and have extensive experience providing our customers with high-quality solutions. Whether it’s a classic car or a state-of-the-art vehicle featuring the latest security systems our dedicated professional team has the means to help you gain access. We provide 24-hour emergency services to ensure that whether you’re stuck on a busy London street in the middle of the day or somewhere else in the middle of the night, you always have a reliable solution that you can turn to. We offer Replacement Keys London services in many parts of East, West, South and North London to ensure that wherever you are, you’re never stuck waiting for a solution that will never come. We can have your replacement key ready for you whether you’re patiently waiting in your home or stuck by the roadside. Our mobile services have rescued many customers who’ve found themselves stuck in the middle of nowhere and our replacement keys are some of the best quality you’ll find in this area. So you don’t have to worry about our keys failing after a couple of weeks. Broken Keys London replacement services are also available from Auto Locksmith London at a very affordable rate. 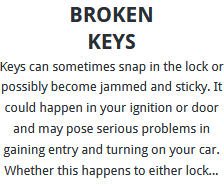 The problem of car keys breaking is far from unusual but you can be sure that when it happens we’ll have you covered. Whether the key breaks outside or in the lock/ignition, we know just what to do to have your key and lock ready so you can continue on your journey without any more issues. Our Broken Keys London replacement service prides itself in providing very high quality replacement keys that are guaranteed to serve you reliably for a long time to come. 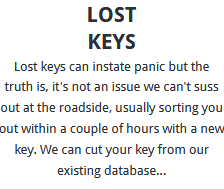 Lost Keys London replacement service is one of the things that keeps us busy most of the time. Whether it’s a case of the key that fell down a drain or a key that mysteriously went missing from your table at the restaurant, we will have replacement ready for you in no time. In case you’re afraid that the key may have been stolen by some unscrupulous individuals we can also change the whole lock or reprogram the system so you don’t have to worry about somebody coming for your car later on. 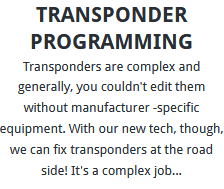 We also offer Transponder Programming London services. Many modern cars are coming with state-of-the-art security systems that are hard to get past. 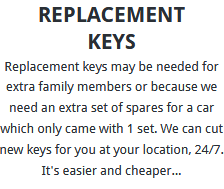 In such cases a simple replacement key isn’t what you need but we’ve still got you covered. In case you’ve lost your transponder or if yours suddenly stops working, we can program a new one for you as quickly as possible. Our programming services work for most vehicles on the market today. When you need a car locksmith in London then there’s no better company to turn to than Auto Locksmith London. We are a professional car locksmith company and we have many years of experience providing car Locksmith London services and as many of our customers will tell you, we’re very good at what we do. We provide 24-hour emergency assistance whether you need a replacement key by the side of the road or in your driveway. We have a very short response time to ensure that you are quickly sorted wherever you are in London so you can continue with your journey peacefully. When you go to many locksmiths, you will realise that they can only provide car locksmith London services for a small range of vehicles but when you call us you are almost assured that we’ll have a solution for your car regardless of the manufacturer or model. We have equipment and expertise to handle key replacement services for a wide range of vehicles. These include both manufacturers based in the UK and those from other countries. Once we get to you, we should have you ready to go in a matter of minutes no matter what kind of car you have. There are many manufacturers who will struggle when it comes to replacing keys for certain vehicle models. This is because each manufacturer has unique codes and designs that they use when manufacturing their keys and locks. However, our state-of-the-art tools and our highly trained locksmith have what it takes to have your replacement key ready with minimal fuss. So whether you have a SAAB or a FORD we have everything you’ll need for your car to be back on the road in no time. Thanks to our excellent workmanship, you can also be sure that any key we prepare for you will serve you reliably. Many new vehicle models are hitting the streets with state-of-the-art locking systems that are making it even harder to bypass the security systems in the car. Transponder systems are becoming even harder to hack and even the rate of car theft has gone down thanks to these systems. The downside is that for the unfortunate owner who happens to lose their keys, accessing the vehicle is a major challenge. However, we have invested a great deal in technology here at Auto Locksmith London and our car locksmith London services will help you to gain access to many vehicles including many of the new models that are just coming out. If your car is something like a Jaguar or Porsche there is no doubt that it cost you a pretty penny. The last thing you’d want to do is give the task or replacing the key to an amateur. Luckily for you our Auto Locksmith London is a professional company and everyone who works for us is a professional you can count on.